If you're in Newcastle, its environs, or indeed anywhere in or near the North East of Angleterre tomorrow, Saturday 27th August, then get yourself to Travelling Man Newcastle from 1-4pm. Why, you ask? Well, TM is the finest purveyor of comics and stuff in the land, they were the first shop to stock my small press wares many moons ago and the staff are some of the awesomest of people ever. But that's not all. 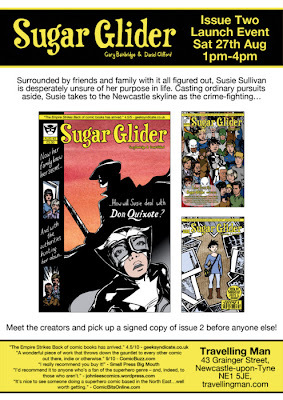 Tomorrow, Daniel Clifford and I are launching Sugar Glider #2. Not only is Susie faced with greater struggles than last time, both at home and in the streets, not only do we get a greater glimpse at some of the wider universe revealed in Sugar Glider Stories, but you also get a bonus comic, Anthony, written by Daniel and drawn by Lee Robinson. And what's more, if you're at Travelling Man tomorrow, you can get yourself a copy of the comic before anyone else, have it signed and have a chat with us. That sounds like a pretty good day out, eh? Daniel and I have made appearances and launched SG and SGS at various events up and down the country, but never have we done anything in the city where Sugar Glider is set. Soon, that oversight will be corrected. So get yourself down there. The full details are here.